My lightweight commuter bike can now be transformed into a workhorse. 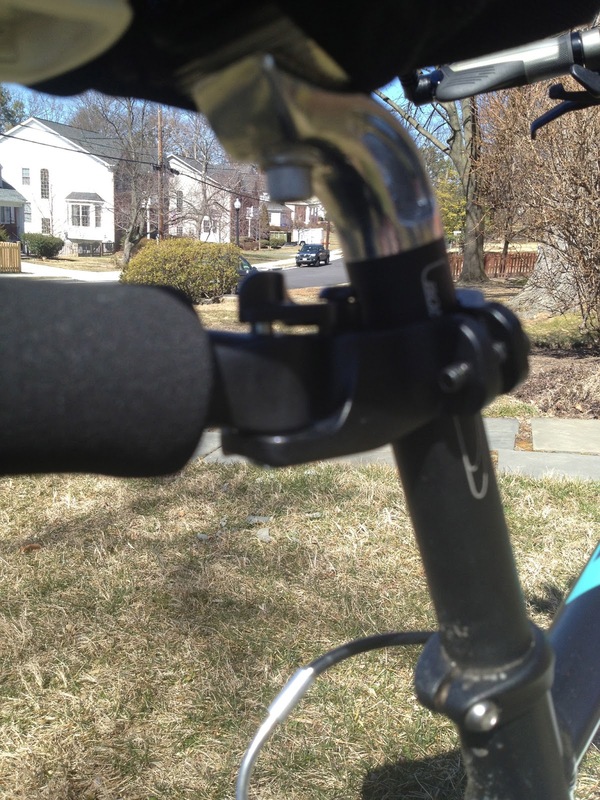 With the simplest press of a lever I can attach the Burley Travoy, which I rode out to REI this morning to purchase. A little back-story. 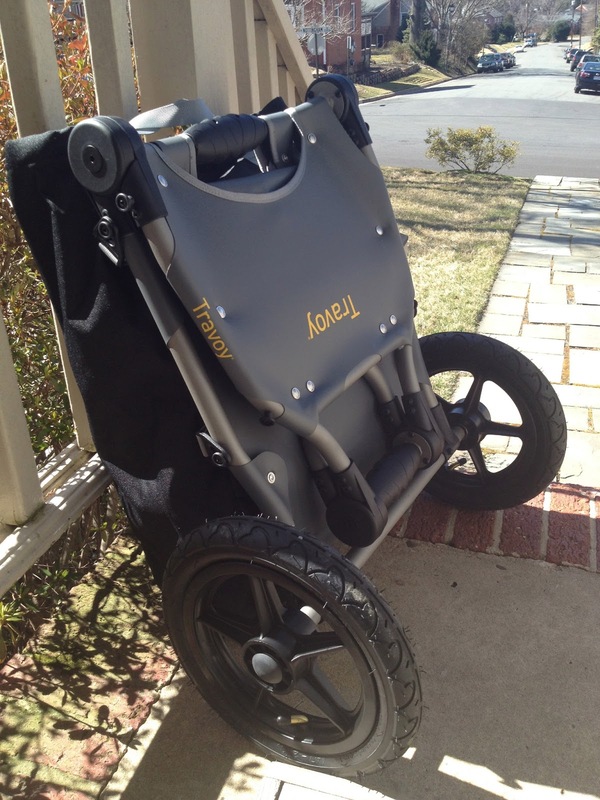 I first read a review of the Travoy on Kent’s Bike Blog – a neverending source of useful information on all things bike – and thought it was the device to solve many of my bike transport problems. But I balked at the $300 price tag and couldn’t quite bring myself to rush out and buy one. Then, last Monday, I attended the National Women’s Bike Summit, which, lucky for me, was in D.C. It was a treat to be surrounded by hundreds of bike enthusiasts, make that women’s bike enthusiasts, and to meet in person some folks I’d only “met” over the Internet (Elly Blue who was kind enough to publish my essay in the Childhood issue of “Taking the Lane” and Barb Chamberlain who tweets out 500+ women’s bike blogs, including mine). When the first Women’s Summit was held last year in Long Beach, I was disheartened to hear (I didn’t attend) that it included a fashion show. Could anything be more stereotypical and trivializing of women’s biking, I thought? Yet I’ll be darned if I wasn’t drawn to the super cute accessories in the pop-up shop at last week’s summit. 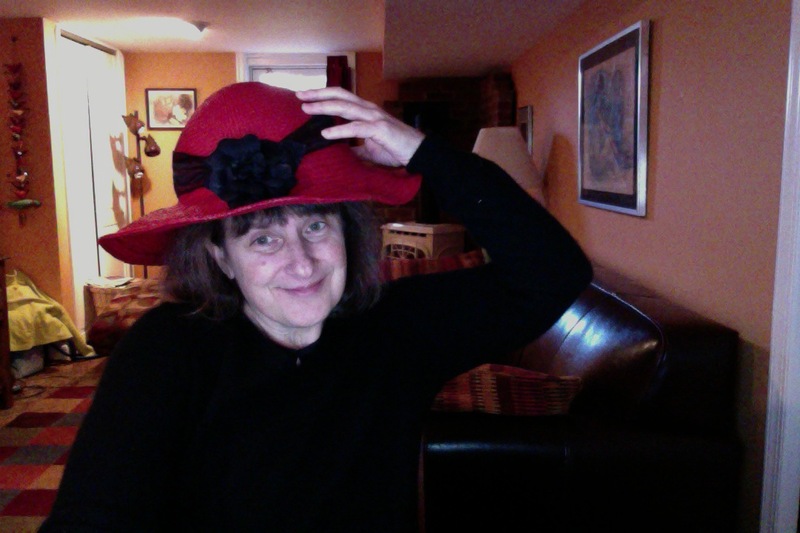 I hereby confess that I bought a very stylish and elegant bike helmet that is covered by a broad brimmed, red straw hat, complete with a black band and flower, which will, I think, be the perfect accoutrement for summer biking (surely just around the corner). So, munch, munch – I’m eating my words, or – well – my thoughts. The Burley Travoy is designed for the urban cyclist who likes to run errands on the bike, perhaps making multiple stops – that’s me! The device is essentially a lightweight dolly that attaches to a pin – the only equipment you need to leave attached to your bike. With one simple twist of the wrist, the towing bar flips up or down; one more twist of the wrist and the dolly folds in half and can be carried, if you don’t care to roll it. The specifications say it can handle up to 60 pounds. 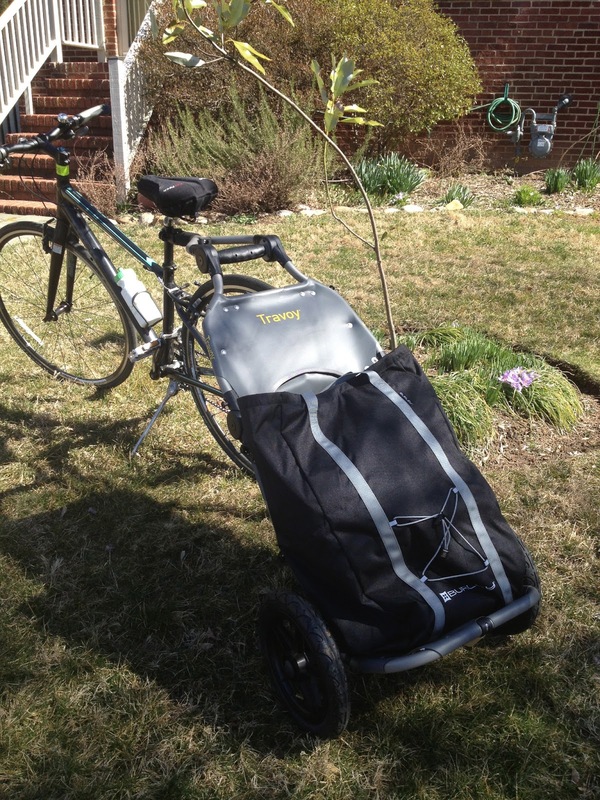 It comes with one large shopping (or carrying) bag, which snaps onto the trailer in seconds. Additional bags can be attached to the upper portion. So, indeed, why not give it a try? Perhaps I needed the permission of a wise woman of bikes to legitimize the expenditure. I rode the less-than-ideal Carlin Springs Drive (too many hills and cars; no bike lanes) to REI, where they were very accommodating about attaching the hub for me so I could ride home with it. It turned out that, because I’m short and my seat isn’t very high, they had to remove the rear rack and bag I had on the bike – both of which easily fit into the Travoy’s carrying sack, with plenty of room to spare. On the way home, I finally located the path that goes from Carlin Springs through the Long Branch Nature Center, connecting up with the Four Mile Run Trail. This allowed me to avoid unpleasant traffic, and gave me a new bike adventure. 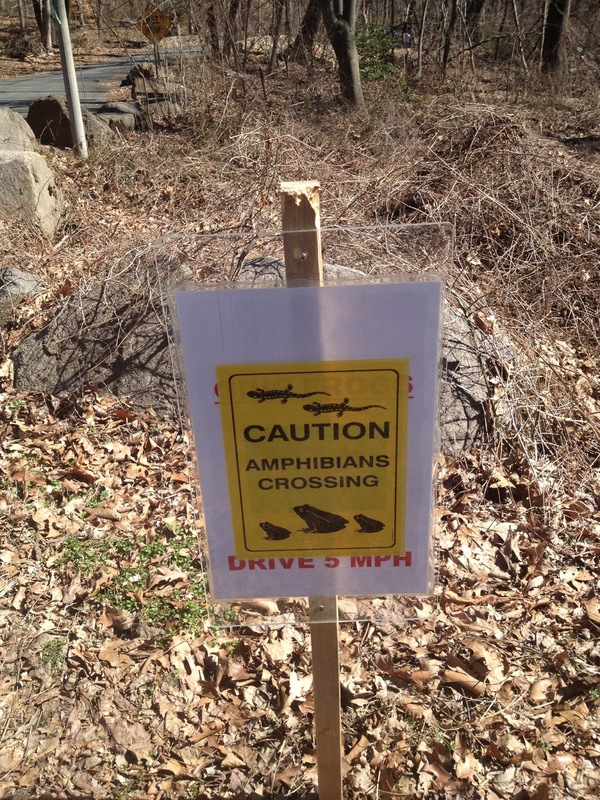 I slowed for the amphibian crossing and noted with appreciation the volunteers who were cleaning up the park. The trailer maneuvered like a dream – I didn’t even know it was there. I can’t wait to go grocery shopping with it tomorrow to see how it handles fully loaded. After I unhitched the Travoy, my bike looked strangely naked without its rear rack. I’m thinking – perhaps I’ll get a cute little front basket for days I have just a few things to carry and don’t need the trailer.